$120 a Day. RIGHT ON Clear Creek. Tiny Home! Overlooks 20ft. trout stream! 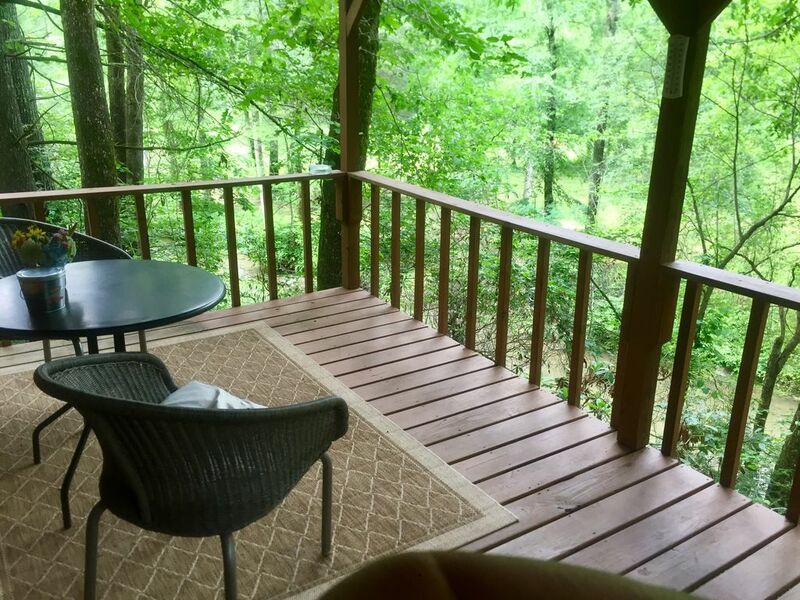 Forest Cabins of Ellijay is set on 6 acres of pristine old-growth forest of hardwoods and huge white pines. The acreage is bordered by about 900 feet of Clear Creek. Clear Creek is about 20 feet wide . And you have a lovely view of the rushing trout stream. Sit on the covered porch and listen to the pileated woodpeckers, babbling stream, crickets, frogs and lake loons. Most visitors will spot deer taking advantage of the creek or a blue heron fishing for supper. Gaze at the millions of sparkling stars. Forget your work-a-day world and relax in the comfort of your little piece of heaven nestled in the Appalachian Mountains. Keywords: Owner-built Tiny house overlooking designated Ga. trout stream, Wildlife galore....float on our tubes to gentle shoals in refreshing cool river-size stream. 3 Beautiful wineries nearby. Amicalola Falls state park 20 minutes away. Fort Mountain State Park 30 minutes away. 2 night minimum, 3 on holidays and October. Ask about our other cabin nearby. Same price! We are only 3 miles from Cartecay Vineyards and about 4 miles from Chateau Meichtry Vineyards. They offer tables on a patio overlooking the vineyard with wine tasting . In colder weather both have a lovely building in which to taste wine. There you taste the wines and view the mountains and valley you are nestled within. Nearby you will find the town of Jasper which has the Sharp Mountain Winery with tours and tastings. Blue Ridge is only 20 minutes away with quaint shops and eatteries. There is an antique steam engine train that you can ride to a nearby town and back to Blue Ridge. Carter's Lake and Lake Blue Ridge are nearby and offer boat rentals and jet skis as well as hiking trails. Amacalola Falls State Park is 20 minutes away with the highest falls east of the Mississippi River. You will enjoy hiking its steps you may climb to the top and back down. They have many trails from easy to expert! We bought and modified an old barnboard cabin here on Clear Creek. We have always enjoyed the mountains and finally moved here from Cartersville only an hour away. We enjoy the colder weather in winter and the cooler summers. We love the anticipation of snow and the views and woods that this area provides. Jim then built the 2 cabins we have here at Forest Cabins all by himself. Come and enjoy the nature, swings, hiking and the babbling streams. You are in the woods on a pond and stream but only 10 minutes from Wal Mart. You have 2 wonderful state parks nearby, Amicalola Falls and Fort Mountain. 3 miles away Cartecay Vineyards offers wine tasting and music on a patio built against an old chimney over-looking their vineyards and surrounded by mountains. We are the mountain biking capital of Georgia. Our Apple Festival the last 2 weekends of October draws people from all around. The arts and crafts are always unique and entertaining. You won't walk away empty-handed. Down town Ellijay offers nice antique shops and restaurants in which you may choose to sit outside and view the surrounding town, weather permitting. About 15 miles away is the town of Blue Ridge which has a steam engine train ride that takes you on a ride to Copper Hill TN. You will pass along the river in outdoor traincars or may choose to sit inside. Blue Ridge also has many shops and restaurants for tourists. Nearby Jasper has Sharp Mountain Winery which has wine tastings. Only about 20 ft from beautiful Clear Creek, a designated , stocked trout stream . The sounds will put you to sleep at night! On 30 ft wide designated Georgia Trout stream. all knives, forks and spoons. sharp knives. grill accessories. Frig under counter. Bakers counter top oven only. 3 gas burners. Mircrowave. Covered porch w/ hot tub, table & chairs. Grill. Surrounded by 6 acres of pristine forest with huge hardwoods and white pine. The owners were super nice. They even gave us some wood to burn in fireplace. It is bigger than it looks. We hiked all three days we were there so there was time to hike and at night time to enjoy the Cabin. If you are lucky enough to get up early you can see deer eating corn spread on the ground just outside your window. The walk to the creek is steep so I would not recommend it if you are over 50 years old.....it is safe though. Just tricky if its wet from rain. Cabin was cozy and clean. The outside of the cabin was cute. The inside needed to have work done. The bathroom door stuck and was very noisy should you need to go to the bathroom. The bathroom shower was hard to adjust. The fireplace worked but was dated. The steep walk to and from the cabin needs to be paved or graveled. During the rain, we slipped and almost fell. The deck was nice and roomy. Location was convenient to downtown Ellijay, restaurants, and wineries. Didn't have bad time as we were out a lot. I decided to write this review as the reviews I based my trip on were all 5's for the most part. I use reviews to plan my trip. If I had know some of the issues above, I might have looked further. My husband and I are 66 and 78 and the trail to the cabin was daunting to us as it was steep and full of roots. Thank you for your review ! And we’re glad you were pleased with the cabin location, cleanliness, porch spaciousness and appearance. We will have to look into the bathroom door problem. Thank you for bringing that to our attention. If you had notified us while you were here, we would’ve been glad to take care of that for you. We aim to please. The fireplace problem will be taken care of also. We are sorry you had a difficult time with the walkway. It’s the first we’ve heard of the walkway being difficult and we will look into it. We make every effort to please our guesrs. Our heaven for 3 days! We were so sorry we didn't get to meet you both! We really enjoyed your cabin/tiny house for the three days during Christmas! Our favorite parts were definitely the stream and fireplace. I can't get over how well you can hear the stream, and even opened the window at night (even though it was 30 outside) so I could hear it throughout the night. The comforter fools you into thinking you won't be warm at night, but my gosh that thing keeps every part of you nice & toasty! We went to the Walmart and got 7 bunches of firewood and used every bit of it when we stayed inside. It was a great fireplace!!!! We went to Mountain Valley Farm (which we had no idea was so close) and got some steaks for the grill, along with some of their home made cheese! Super yummy! We also took a ride to Amicalola Falls, which was beautiful...and another ride to Dahlonega to just putz around town. It was a great stay, and thank you for allowing us to enjoy your place! We had a great time staying in Ellijah. The tiny cabin was very comfortable and had everything we needed for our stay. It was a cold weekend for this Florida couple but having a fire in the fireplace warmed up the cabin and made it cozy. The creek was beautiful. Jim and Sally were very nice. My husband enjoyed talking hunting stories with Jim. A dream come true for this Florida girl. Love and miss Jim and Sally! Amicalola State Park is only 20 minutes east of us. It has the highest falls east of the Mississippi. Fort Mountain State Park is only about 20 miles from Ellijay town center. It has the primitive ruins of rock walls that are the work of prehistoric man. Dalonega , Ga. is only about 37 miles from us. They have a very interesting and fun gold museum b/c gold was 1st found in Georgia in this town. It was a Gold Mine Town. Blue Ridge has a steam engine train that takes you to Tennesee and N.C. Volunteers tell of the history of our area while in transit. That is only about 15 miles north of us. The shops in Blue Ridge are worth a visit also. Chattanooga is an hour and a half away with the aquarium, Imax, period locomotive with cars made into dining areas and is a restaurant. Chattanooga also has Lookout Mountain and Rock City. Both worth the ride! Atlanta is about and hour and a half from us and is a goldmine of culture with museums and statues and much history of our Martin Luther King. The Coca Cola Experience is educational and fun. Grant Park, south of down town Atlanta, is a state of the art facility and has the Cyclorama.....google that! During October and the first week of Nov. the apple houses offer an array of apples including, September Wonder, Gala, Stayman Winesap, golden delicious and many other. Products made with local apples are available. They include fried pies, apple butter, apple slushies, cider, and apple fritters, cakes and doughnuts. Other fresh produce available at the apple houses are sweet potatoes, tomatoes, home-made soup starter and onions.